Looking for an old-school, haunted house movie with a twis t? 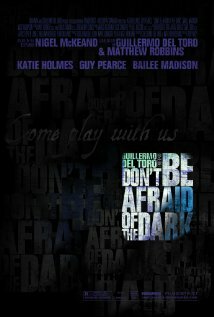 Go see Don’t be Afraid of the Dark. The setting is stunning: imposing, gothic architecture, old-fashioned decor inside (think of the houses in Beetlejuice and Casper) and a foreboding basement. Sally (Bailee Madison) is a lonely little girl forced to move into a huge, gloomy house while her father (Guy Pearce) and his girlfriend (Katie Holmes) finish the renovation. Very soon she hears ominous voices coming from the basement asking to be let out and promising to be her friend. These whispers are chilling. What has Sally unearthed? A ghost, or something else? Don’t be expecting any huge scares but the atmosphere is deliciously eerie and the actress playing Sally gives the best performance of all three stars. She seems older beyond her years and even outshines Katie Holmes, though Holmes is also good, giving a natural and credible performance of a woman trying hard not to be the evil stepmother. Pearce usually delivers compelling performances but here he just doesn’t have much to do. Those who are looking to be terrified and expecting a fast moving horror may be disappointed but if you like a slow burner you should enjoy. This entry was posted in Film Reviews and tagged don't be afraid of the dark, film review, guy pearce, haunted house, horror, katie holmes. Bookmark the permalink.